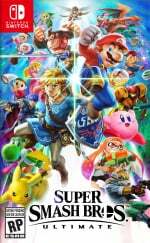 We are aware that some users are posting about possible issues with the latest Super Smash Bros. Ultimate update. After extensive testing, Nintendo has not been able to confirm that there is an issue, although we will continue to investigate and monitor the situation. It left users who had been affected by this problem scratching their heads. After some ongoing detective work, it appears as if the cause of this issue might have been narrowed down. "I'm having issues with my card, and mine was verified as authentic using Samsung's Memory Card Authentication Utility, and verified as having no bad blocks using h2testw." Have you encountered this problem yourself? Are you enjoying playing as Piranha Plant? Tell us below. Oh, the irony. If only we had like... decent internal storage... that sure wouldn't be a major concern. Was planning to upgrade to a 256GB, now I guess I'll have to double check the customer reviews. So, a report of some guys with circumstantial eveidence. And an awesome way for Nintendo to put the blame on someone else. @rushiosan As much as we'd all love to have a bigger internal storage, in Nintendo's defense, flash storage is hella expensive. Smartphones are a perfect example. Why do you think some flagship phones still have 32/64gb as base storage? Nintendo could have easily put > 32gigs in there but that'll jack up the price for sure. For better or worse, they still gave the option to expand. @rushiosan what irony? I mean, even PS4 users have trouble storing more than 10 - 20 games (less than I can store on my 128GB card for Switch by a long shot) due to size. @Bliquid Nintendo didn't put the blame on anyone. They said they haven't been able to reproduce the problem. The report about dodgy SD cards came from a reddit thread. It's an easy to read article, not sure how you managed to get that impression from it. And even that would be a limiting factor. 128GB of retail game downloads would also fill up really quickly. The best would have been a 256GB Switch, but that would've been nearly double the price of the regular one. Saying "Nintendo should've released the Switch with more internal storage" is the same as saying "the Switch should've failed like the Wii U". The only real issue is that conterfeit SD cards are sold all the time, even when you're buying from a legitimate seller like Amazon, yet it's very hard to tell the differene these days as many come in the exactly the same packaging and are indistinguishable from the real thing. Like all storage media though, nothing lasts forever; they have a finite life. @sanderev a 256GB switch wouldnt be double the price. Unless these were made by Apple I guess. A 32gb SSD goes for about $15. A 256GB goes for about $40. That being said you can get a 400GB card for $40 now. @Sabroni and mine is an easy to read comment. I didn’t state they did, just they they could and would. @Marioman64 that's because this is fake news. @Marioman64 that’s correct, however games can be installed on an SD card and perhaps the back-and-forth between game data read/writing and save creation or updating can cause the issue. It’s essentially like two partitions talking to one another. @Bliquid easy to read and easy to interpret at face value, which is suggestive that Nintendo are/or would be using this as an excuse. After all, providing a reason for something that hasn’t happened yet is typically suggestive. Whether you stated they did or would, the same underlying notion is there. Personally, I don’t see Nintendo using this as an ‘excuse’. As a company and based on their typical behaviour, they are much more likely to say nothing at all moving forward or eventually find, acknowledge and fix the issue. @Trajan SSD? No. SD card. There is a difference. The internal memory of a Switch is a LOT faster (= more expensive) than a normal SD card. 128 GB in a Switch would be comparable to an PCI-E nmve SSD of that storage. And yes, they have been getting a lot cheaper so take one of the time Nintendo released the Switch. @Bliquid @Raiutora "Personally, I don’t see Nintendo using this as an ‘excuse’. As a company and based on their typical behaviour, they are much more likely to say nothing at all moving forward or eventually find, acknowledge and fix the issue." The only typical behavior of Nintendo regarding 3rd party products IS to blame the 3rd party products. I'm not sure if they will in this case, b/c I'm not sure they'll ever figure it out, but it is a logical conclusion that it's the SD cards fault as so far it only seems to be an issue on digitally downloaded versions of the game, not on cart. I'm guessing whether the SD card is counterfeit or not won't be the problem though. It is weird that it only happens when the game is on SD cards though since the save file isn't on the card. But the update is, and that does seem to be the problem as nobody reported the problem before the update as far as I know. @nate83km the PS4 also has much more graphically impressive games on the system. I gladly let RDR2 take up 103 GB on my PS4, but it annoys the p*** out of me every time I see my Switch's 32GB base storage full. @LegendOfStewart every physical games on ps4 takes internal storage, you can't play games without installing part of the game, with the switch you don't need to install part of a game to play a physical game. I installed red dead 2 on my 500g ps4 and I had to delete 5 physical games to be able to play the game I have on bluray. I don't have this problem with my switch. I was thinking the same after reading this article. But Nintendo does interesting things to expose counterfeit/non license products attached to their hardware. That 2.0 update along side the Pirauna dlc was the trigger this time. @nathatruc and the tradeoff is actually getting to play RDR2. It would take a 250 gb to get a game like that to stutter along at 10 fps on Switch. @rjejr To be fair, it was the third party docks causing the bricking issue. While it's true Nintendo didn't use standard USB-C coding to run the Switch in docked mode, it was up to the third parties to research & test their products thoroughly before releasing them. @LegendOfStewart Just a nitpick on this one, but due to the type of storage Nintendo are using on the Switch, game storage sizes are considerably smaller than they are compared with other consoles. Take Doom.. it's 73GB on the PS4, 13GB on the Switch. While I agree that the Switch could probably not run RDR2, I doubt the game would take up anywhere near the same storage space that it did on PS4 (especially with all backend changes that would need to be made to port it). I have the 400GB Sandisk microSD that went on sale around Black Friday. Luckily, it seems to be running on the Switch just fine. I have been playing with Piranha Plant a lot in several different modes and I've not had a problem. If you can find this card on sale I'd definitely recommend picking it up. It's really fast and you'll realistically never need another memory card for the Switch. @LegendOfStewart it's a impressive graphically, really beautiful but I didn't liked it. I've found the game boring and the I didn't like the gameplay but the animations and the attention to details is really breath taking. But it's still in my harddrive and I plan to play it again soon. @Trajan You're comparing 2019 SD card prices, forgetting the fact that Switch launched in March 2017. SD card prices were higher at that time for the same storage space. For example, the Samsung Ultra 400 GB micro SD card was selling for $250 on Amazon in January 2018. These days, they sell it for $80. @AlphaElite @sanderev I'm talking about now, not 2017. That comment read to me as if Nintendo were today to offer a larger model. @Mando44646 It's not the save data that cause the corruption, it's the Pirahna Plant download. The data of the Pirahna Plant download will be save directly to the SD Card and if the SD Card is a fake one and player try to save that to the actual system memory by playing the game it will corrupt as it would not be able to find a trace that the Pirahna Plant download exist cause a fake SD Card could delete a data at any time. 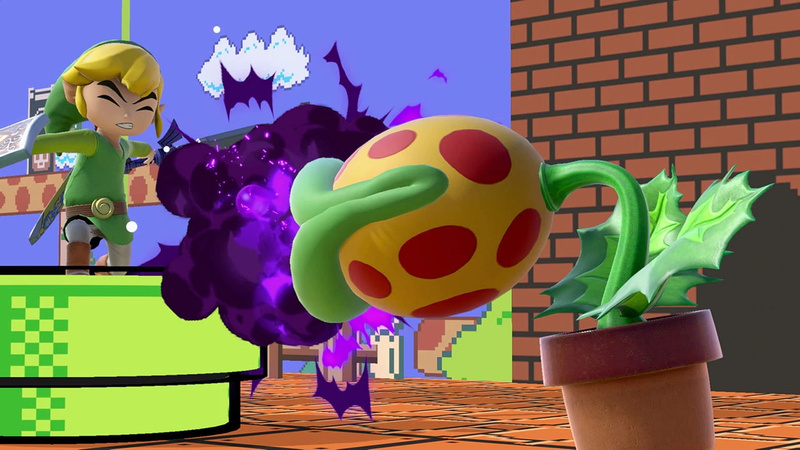 When people play using the Pirahna Plant using a fake SD Card, the data file is still there but when they attempt to save the file to the system, it corrupted cause the fake SD Card deleted the Pirahna Plant data making the system confused cause it was there for a while. It's like buying a 256gb card which works fine at first then later finding out all the stuff you just put in are gone cause the card is just a counterfeit and 256gb is really just nothing. @retro_player_22 Failing SD cards don't happen because a piranha plant DLC was downloaded, and fake SD cards shouldn't have specifically problematic use for storing a specific download. I could see a systematic flaw in an SD card leading to trouble, but the issues with fake SD cards is usually that they're poorly made and degrade far before the real one would. Not bad interaction with specific data among numerous different users. Unless Ninty is doing something very odd. @RadiantDuck are you digital or physical purchase. Knock wood, my save hasn't corrupted yet but the digital game install keeps corrupting post 2.0. Physical. I took the SD card out and redownloaded the update. Luckily my save was there. Must be a dodgy card after all. @RadiantDuck Glad to hear your save is ok!! I wish I could try on my second (third switch in the house) Switch, to test, but then I'd have to unlock the fighters to duplicate. I'm starting to wonder if the emphasis on the piranha in social media is leading Nintendo away from diagnosing whatever the actual problem is. It could be the SD card.....but suddenly we all have dodgy SD cards that spontaneously started with Switch 7.0, Smash 2.0? @SethNintendo they don't make them like they used to ;0) heh, mine are all still working too! Well, all the official ones are. I have a few dead Dreamcast non-VMU units that have died, but apart from that they're all good! I guess they weren't used as much as media storage these days. Is it the actual game save file? Because I thought thay was stored locally on the switch? Game saves aren't stored on SD. @LegendOfStewart You could make the same claim that the tradeoff is getting to actually experience Breath of the Wild (in my opinion, an infinitely better game). I hated RDR2; was so shockingly disappointed by it, because I loved the first. The law system it forces on every aspect, while making your character slow to react to it is terrible design. They forgot to make sure this Cowboy Simulator played well. @SethNintendo what are you talking about? I've not said anything about rockstar or PC's are you replying to the right person? @DanteSolablood "it's true Nintendo didn't use standard USB-C coding"
But they did use a standard USB-C port, and they called it a USB-C port, unlike Apple who calls it Thunderbolt or whatever. So yes, it is the 3rd parties fault, but that's like saying it's the lion's fault when it walks into the big pit hole trap that the hunters dug out and covered in leaves. @Gravitron classic iPods used small HDDs. Nobody wants to have those in a portable device today. 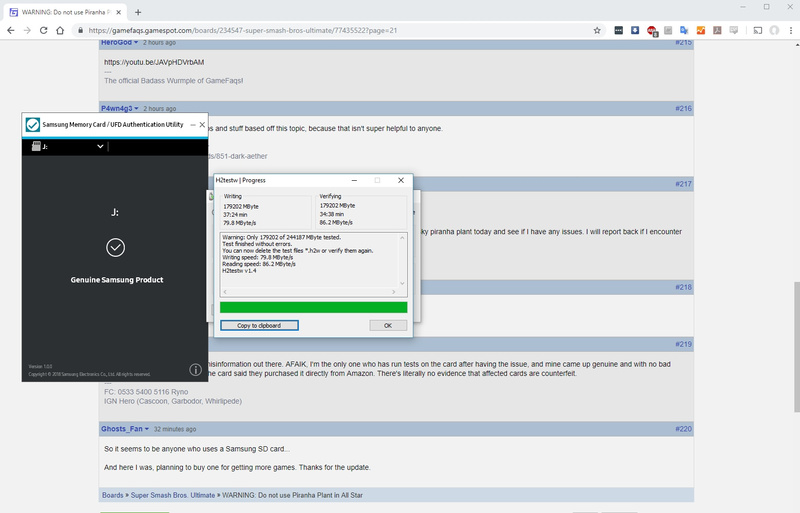 @NEStalgia It's possible that the Pirahna Plant DLC was not meant to be download to a fake SD Card then again some people claim that it also corrupt on an actual card as well so I'm sure. Actual SD Card and memory card also had a history of data corruption so I guess it really depends on what kind of branded card you use. That this seems specific to one game, specifically after a patch means we're not talking about random chance SD problems. If this had been a story for the past year, we could assume some really bad SD cards were out in the market during the Switch era. But instead, we're talking about one game affected specifically after an OS & game update. Now, it could be bad interaction in some way with specific brands of cards, or specific technologies used in some cards etc. If that were the case, I'd almost think that this is a switch 7.0 problem, not a smash problem. Smash just handles data and save data, the OS handles the read/write. So if it's smash itself, then it's probably not an SD hardware problem. Luckily I have a Samsung 128 micro-sd, and a official one as far as I know. Anyway, I won't use Piranha plant untill the problem is solved.